We have discussed this before, but I am a breakfast gal. I love french toast, pancakes, all eggs, benedicts, breakfast burritos… pretty much all things breakfast. Really. I have never met an egg I didn’t like and always leave brunch happy, except when I order Biscuits and Gravy. It just never hits the spot. The gravy is too runny for my taste and the biscuits are soggy and mushy. No thanks! So I took it upon myself to make a homemade version to change my mind and decided to add a little kick for us because we like some spice. 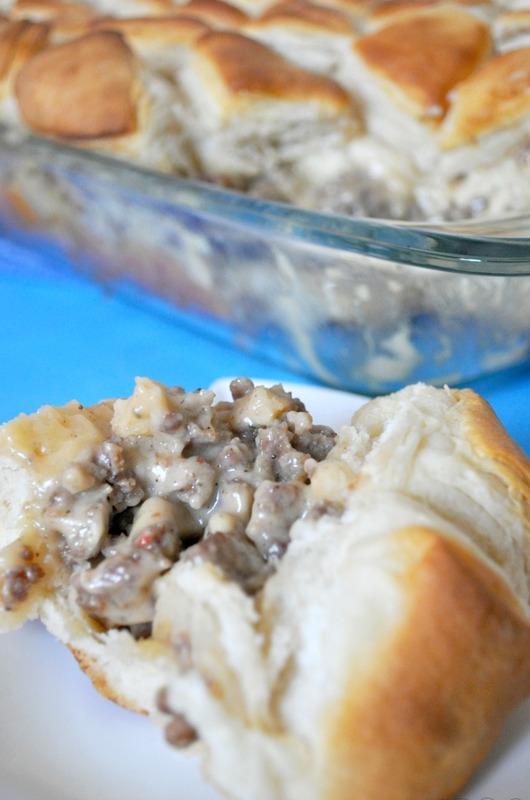 This Biscuits and Gravy Casserole exceeded all my expectations! The biscuits remained nice and fluffy, not overly soaked at all by too much gravy. I want my biscuits to maintain peak golden and fluffy biscuits. Plus, it’s easy to make with the convenience of canned biscuits. PLUS, plus, it was delicious!! I will probably continue to avoid biscuits and gravy at a restaurant, but I will be making this again. Problem solved. I truly suggest using the hot sausage if you like some spice. By itself, it would maybe be a little too hot for us, but it is perfectly tamed with the carbs. We loved it! 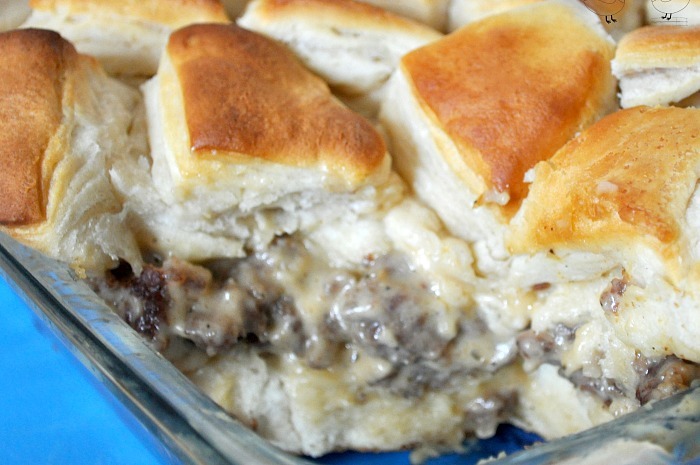 Amazing Biscuits and Gravy Casserole with fluffy biscuits and delicious sausage gravy. Spray a small casserole dish with cooking spray (approximately 7x10) with cooking spray. Cut the biscuits into quarters. Layer half of them in the prepared pan. Now, prepare the sausage and gravy mixture. Do it while biscuits are baking or wait until after if you prefer. In a skillet with high sides, brown the breakfast sausage until fully cooked. Sprinkle the cooked sausage with 3 Tablespoons of flour and cook for a few minutes until absorbed. Add milk, salt and pepper, and stir frequently until mixture comes to a slight boil and thickens a bit. Now, make sure to taste. I usually add more pepper when I use mild breakfast sausage. At this point, evaluate whether you need to add a little extra milk. I like the gravy to have such enough liquid to thoroughly cover all the biscuits without drowning them. Now, pour gravy over the cooked biscuits and add the remaining uncooked biscuits over the gravy mixture. Bake the casserole for 25 minutes or until golden brown. If i wanted to double the recipe could it be made in a 9×13 pan? Biscuits and Gravy are a staple around my house. Love this variation. Would love if you linked up with us at Mommy Needs a Timeout Thursday. We party starting at 8 pm EST on Wednesdays! Hope to see you there! Biscuits and gravy is one of my favorite decadent brunch treats, though I hardly ever eat it because, like you, I’ve had some bad experiences with them at restaurants. However, this looks totally up my alley and like something that would be easy and delicious for a weekend morning, so thanks for sharing! Popping over from last week’s #thatsfreshfriday! I hope to see you back this week at the party that begins at 7 p.m. EST Thursday evening and goes throughout the weekend! Keep up the great work! my husband loves biscuits and graby. I will have to make this for him. This is a great recipe that I will definitely be saving for Thanksgiving and Christmas family time. A great way to make something so yummy for so many people! Wow, that looks like it would really hit the spot for breakfast! This looks like something my husband’s family would love. They tell me stories about breakfasts like this on the farm, back in the day. Pinned for later. Thanks! My husband absolutely loves biscuits and gravy! Oh yum! 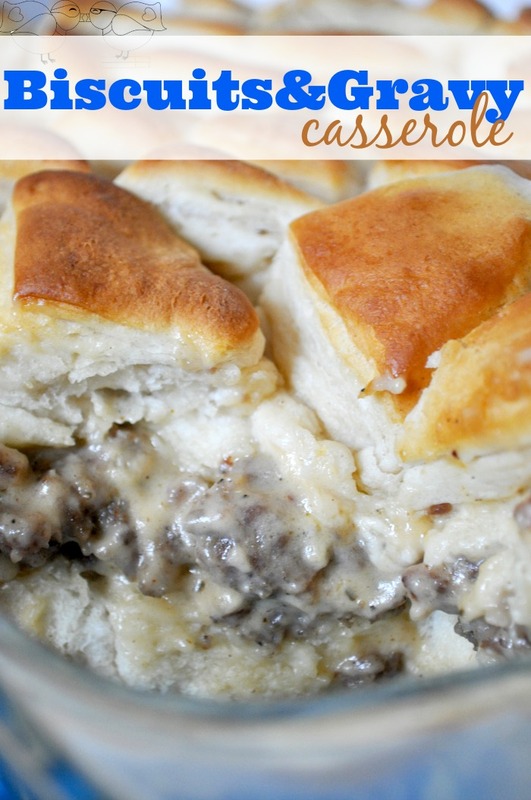 We make biscuits and gravy all the time here at home but I’ve neve thought to throw it together as a casserole – which opens the options of freeze meals! That does look delicious. We love gravy and biscuits We make it quite often, but not in casserole form. Yum! That looks like an awesome Sunday morning breakfast! I love biscuits and gravy! I’ve had some at a restaurant too and it was really bland and kind of gross. There’s got to be some spice to it! That sounds SO amazing! So wish I was not on low carb. Mmm this looks SO good. I have been craving biscuits and gravy for a while now!